The film's gorgeous imagery won't have quite the same punch on the small screen, but it's still a great kids' video. Parents, however, might not be able to stand the endless and incredibly annoying music. The horse soon escapes with the help of Little Creek (Daniel Studi), a Lakota brave also captured by the soldiers, and the two form a bond as they return to the Indian's tribe. Although he's attracted to a foxy blonde-maned, blue-eyed mare (oh, please! ), Spirit longs to return to his heard. But an attack on the Lakota by the Cavalry puts the stallion and his two-legged pal on the run again, leading to a recapture and a rousing, action-packed, amazingly animated finale involving a railroad locomotive and a forest fire. 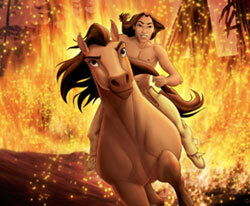 Written by John Fusco ("Young Guns," "Thunderheart") and directed by the DreamWorks animation team of Kelly Asbury and Lorna Cook (veterans of "The Prince of Egypt," the studio's first feature cartoon), "Spirit" overcomes several problems -- like the fact that it glosses over an apparent massacre of the Lakota -- to become quite captivating, sincere, symbolic and respectful of nature and all the cultures it depicts (even the colonel has a good side). It's just a pity the soundtrack is such an assault on the ears that it makes this otherwise elegant, enjoyable film truly difficult to sit through.